Which European Country Is Right For Me? International Language Programs has opportunities for you to help children in countries across the world, but a lot of those countries happen to be in Europe! Here's how to narrow it down. If we're being honest, we get this question all of the time. How do you choose between a semester of exploring towering cathedrals in Russia or days sipping on chocolate at cafes in Ukraine? If it seems like a tough choice, you're right ... we don't have favorites when it comes to our countries in Europe. If you have your heart set on living in Europe, you can spend a semester in Russia, Ukraine, Lithuania, and Romania as an ILP volunteer. There are many, many, many similarities between these countries (we'll get to that later), but a few differences as well. Knowing what kind of experience you're looking for may help you choose. The biggest difference between countries in Europe is what you'll be doing as a volunteer. We have one orphanage program in Romania while the other countries have volunteers teaching English. Everyone will be volunteering for no more than 20 hours a week, but how you'll be making a difference is pretty different. For Russia, Lithuania, and Ukraine volunteers will be teaching English at local schools using the ILP method. In all our European countries, we have a huge range of ages, so you will probably be spending afternoons with younger kids while you do an art project, and ending your evening with older kids who know enough English to make some hypotheses about a science experiment. Since speaking English is such a valuable skill, you are really giving these kids a huge leg-up when it comes to their future. 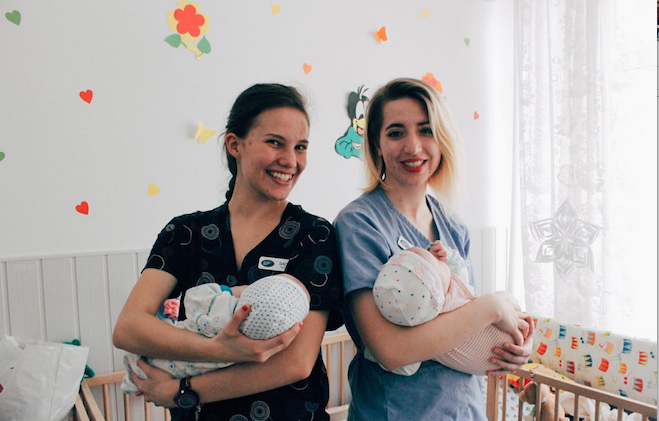 In Romania, volunteers will be spending their time with children in the orphanage program, helping kids reach developmental milestones. They have their basic needs met (like food, clothing, and shelter), so volunteers are there to devote their time and love. That may mean helping kids go from wobbling to walking, singing lullabies, stretching out sore muscles, or helping them prepare to be adopted and the transition that comes with that. The kids you'll be with often have developmental or physical delays; having one-on-one time with someone who is there solely to love and care for them is crucial for their development. There's a lot of overlap with our countries when it comes to things to do in your free time — every city in Europe has pretty buildings, yummy pastries, cool churches, etc — but one of the main differences between our available countries is the overall feel. Are you looking for a pulsing city, sprawled out between towering skyscrapers and rolling parks, or would you rather have a smaller Old Town that's more walkable, something you can explore in a day or two? In cities like Moscow and Kiev, you'll be getting around using the metro because you'll likely be living in cities that encompass several neighborhoods and sections of the city. These cities are huge and full of parks, cathedrals, museums, and more to explore. You could spend weekend after weekend touring different parts of your capital city and feel like you've hopped over to new cities, all without actually leaving. Or, maybe you'll be happier in a capital city that feels smaller; it's more compact, less spread out, and you'll get around using a trolley car or bus to get around, rather than a metro. 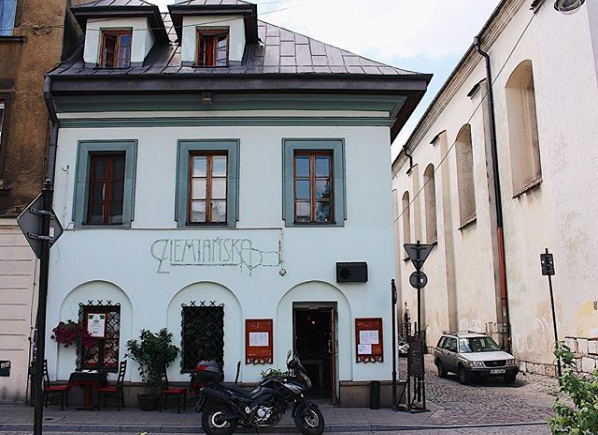 For volunteers in Lithuania, this is more of what your semester will be like. Your city center is more localized, giving you the chance to get very familiar with what's in your neighborhood and the downtown area, and become a regular at the same cafes or ice cream shops. We think Europe's biggest selling point is all the traveling you get to do during your semester! Each one of ILP's European countries is incredibly well-connected when it comes to your semester plans, which means every ILP Europe volunteer visits the same European countries. Every ILP Europe country gets the same massive list of approved country vacation spots — countries like France, Italy, Ireland, England, Switzerland, Spain, Portugal, Denmark, Sweden, Finland, Iceland, Croatia, Hungary, the Czech Republic, Austria .... and so many more! Thanks to overnight trains and budget flights, really no country is out of reach when it comes to what countries you'll see on your semester, but if you have your heart set on certain weekend trips, that could factor into your decision. 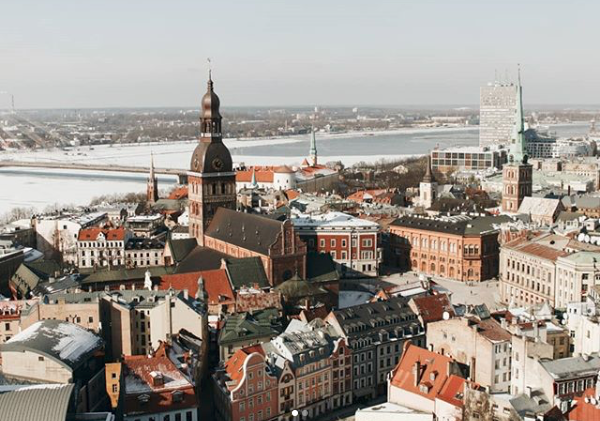 Volunteers in Lithuania are very close to Latvia and most typically take a Saturday and Sunday to see Riga. But some volunteers in Russia are just an overnight train away from St. Petersburg which means waking up and taking a ferry over to spend a Saturday in Finland. See what we mean? Every ILP Europe location has some serious perks when it comes to traveling, but since you'll each get vacation days, it equals out. If you're living in Lithuania but still want to experience Ukraine, head there on vacation (and vice versa). It's not like you're limited on where you can go depending on your ILP country. If you're planning on doing some traveling after your ILP semester, that may factor into what European country would be best for you. Honestly, one serious perk of volunteering in Russia is the chance to experience a culture that is a little out of reach for most travelers). Russia is traditional. Russia is beautiful. Russia is classic — but so many people don't get the chance to visit because the visa to get there is pretty expensive and a bit complicated, plus flights to Russia tend to be pricey. But ILP takes care of all that for you! Russia is the only ILP country in Europe that you need a special visa for, so volunteers in other countries really don't travel there ... but if you're in Russia, you get to see it all. Live in Russia, then go visit the other ILP countries (and more) on vacation. It's something to consider for serious travelers who want to see it all. Another thing to think about; countries in Eastern Europe aren't as accessible as countries in Western Europe. How many times do you see flights to France verses flights to Latvia? Or flights to Germany instead of flights to Romania? By living in countries like Lithuania and Ukraine and Romania, you'll immerse yourself in a country and culture that you might not experience otherwise (and be close to countries you might not have thought of visiting before). When you can actually sign up for a semester abroad can also be a factor in your choice. Lithuania, Ukraine, and Romania have three semesters that you can apply for: spring, summer, and fall. Russia, however, only has a spring and fall semester, so no summer groups here. If you're only available during the summer, looks like Russia's out for you. But Really, How Are They Similar? We pull out certain features of different countries to help paint a picture of some of the things you can do in that country (like sailing around a castle or peeking into ancient monasteries) ... but if you want the truth, there are so many similarities it can be hard to tell one country from another in some respects. Think about it: so many of these countries have a huge Russian influence because guess what, at some point or another, Russia invaded and took over that country. That means several countries that have their own nationality, but one that is heavily shaped by Russian food, the Russian language and Russian culture ... even when you're living in Lithuania. Religion and other cultural practices also mesh these countries together. Europe was traditionally run by lords and rulers who lived in castles ... meaning you'll have ancient castles in every one. 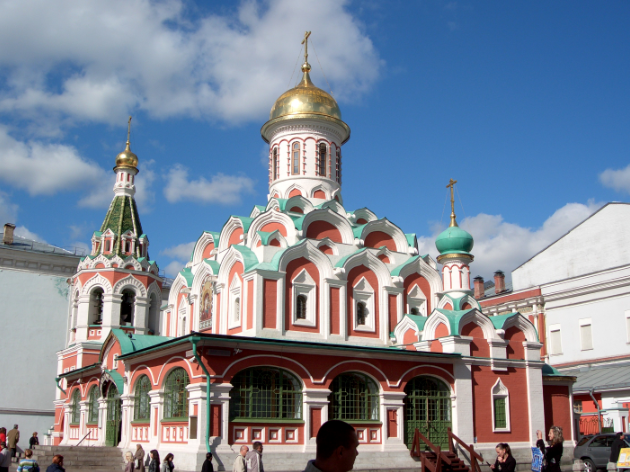 There's a large influence of Russian Orthodox and Catholicism, which means dozens of churches filled with painted frescos and stained glass windows (and a few with onion-topped domes). Consistently across Europe, you'll see modern buildings mixed in with old stone churches and tiny homes, with narrow streets and pretty parks. Plus, all of Europe is way more charming than the United States, so you'll see quiet neighborhoods with small, painted homes, or block-style apartment buildings, brightened up with a smattering of coloring street murals. Much of life in Europe is just similar to each other and widely different than life in America; cobblestoned streets, city squares filled with pigeons, impossibly tiny cars, and food you don't recognize at your local grocery store — a lot of every volunteer's day-to-day life is really very very similar to another volunteer's day-to-day life, even if they're in a different country. Everyone heads to a local store for a snacks, explores a new park, photographs a couple of churches, checks out a treat at the local cafes, visits some museums, and takes public transport to get around. We mentioned earlier that we get this question all of the time ... and so do people on the ILP Europe Facebook page. Whenever someone is deciding between two countries (like Lithuania or Ukraine in this situation) and asks Facebook, it's funny to watch. 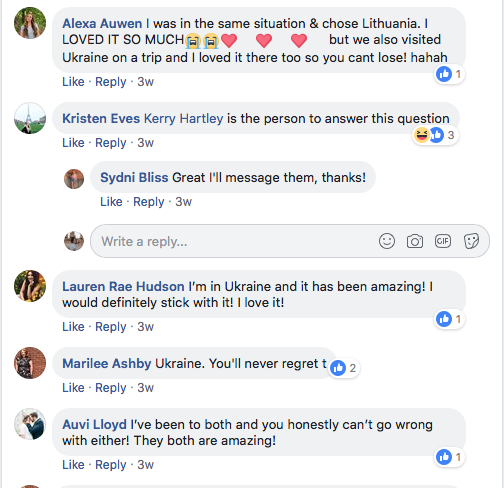 Everyone who went to Lithuania is saying that Lithuania is the best ... and everyone who volunteered in Ukraine is arguing that their country is best. You can get some less-biased insight for volunteers who happened to volunteer in (or visit) both places ... but even then it's hard because people pretty much love both experiences. The little lesson here? Maybe take some advice from Kerry Hartley who has volunteered with ILP 10 times and said " if you honestly can’t decide I’d say let ILP surprise you."